Both the Windows Phone and Windows 8 apps have live tiles which can be controlled by the developer. But where the Windows Phone tiles have the front and back sides, Windows 8 tiles have a notification queue. Live tile’s notification queue can be used to show multiple different messages to the user, like the latest news items or recent emails. Here’s some example code which shows how to use the notification queue in a Windows 8 Metro app and how to update the queue periodically using a ASP.NET Web Api backend. The source code for the following examples is available from GitHub. The following scenarios shows how to use the Update and StartPeriodicUpdateBatch-methods. With notification queue enabled, the app can show up to five notifications in its tile. When a new notification is added to the queue, it replaces an older notification. But it’s possible to add an ID (to tag) a notification. Notifications can be given a tag so that a new notification with a specific tag will replace an older notification with the same tag, regardless of its place in the queue. The notifications in the notification queue may have an expiration time. This can be used in situations where the tile is used to show time sensitive information, like TV shows. If your notification content has a significantly different useful lifespan—shorter or longer—you can explicitly set an expiration time for each notification, and it is a best practice to do so. This prevents stale or irrelevant content from remaining in the queue. If it’s enough that the tile’s notification queue is updated only when the app is run, there’s no need for a backend. You can update the live tile for example in MainPage’s OnNavigateTo-method. If you don’t enable the notification queue, the last notification will override the previous one. So it’s only possible to show one notification on your tile. In a case where the live tile should be updated automatically with new notifications, it’s necessary to create a backend. Your backend will return exactly the same XML as the local tile updates use. What’s maybe a little strange is that you’re backend won’t return all of the notification simultaneously. For example if you want to show 5 most recent news items on your tile, your app will call your backend five times and it’s up to the backend to return a different item each time. Probably the easiest way to handle this is to give the app five different urls. Each url contains a different parameter which triggers the backend to return the correct item. Maybe the easiest way to create a custom backend for your app is to use self-hosted ASP.NET Web Api program. Just make sure that it returns XML and not JSON. When the backend is ready, the TileUpdater’s StartPeriodicUpdateBatch can be used connect your app to the backend. MainPage’s OnNavigateTo is again a good place to call the TileUpdater. As with the local updates, the app must enable the notification queue for the app. The notification queue must be updated every time the app is run. The notification queue must be updated periodically by calling a backend. In a scenario like this, it’s enough to call the StartPeriodicUpdateBatch-method when the application is run. When you call that method it will start the updates and it will (based on Fiddler) immediately call the backend and update the tiles. There’s no need to call the Update-method of TileUpdater so the same code as in Scenario 2 can be applied in here. 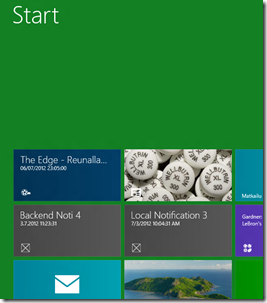 Notification queue doesn’t seem to work if the app is run inside the Windows 8 simulator. Instead the local machine deployment should be used to test the code. The source code for these examples is available from GitHub.